Chris and Haley stand in front of their poster at TAS. 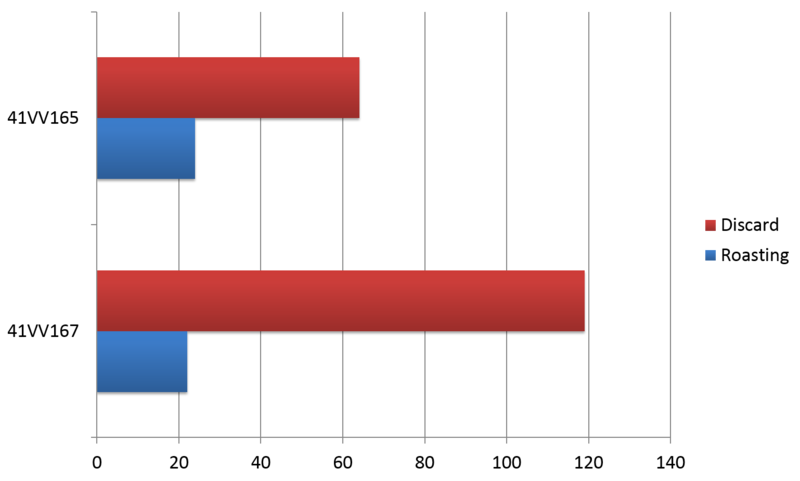 The Eagle Nest Canyon (ENC) faunal diversity has been significantly less than that found in Arenosa Shelter. Analysis of the faunal remains recovered in 2014 from Eagle Cave and Skiles Shelter has expanded the species diversity from that previously reported. Subsistence remains from the ENC sites show a reliance on deer and rabbits from the canyon and uplands, together with fish from the Rio Grande. Further alteration by bone technology processes similar to Arenosa Shelter is also present in the ENC faunal materials. Skiles Shelter, site 41VV165 (left), and Eagle Cave, site 41VV167 (right). 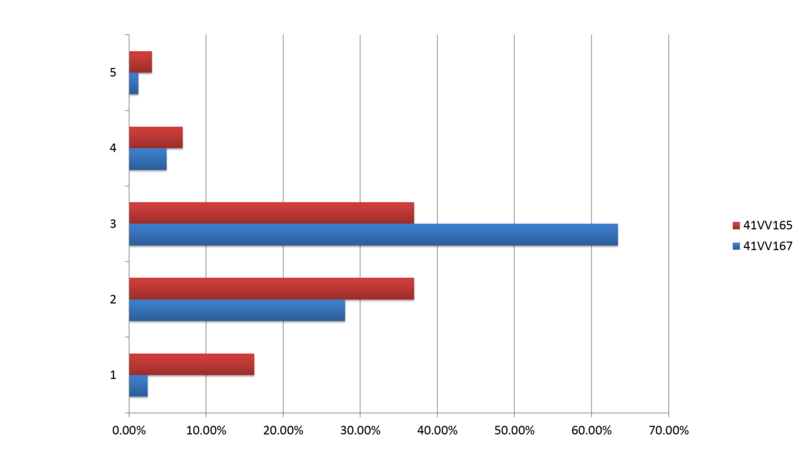 Analysis methods were similar to those used in the Arenosa Shelter study, with the addition of large mammal bone fragmentation. Differences in teeth, bone, antler, and shell were used to classify animals by taxa. Specimens were identified based on size and visual characteristics of skeletal elements or teeth. Visual characteristics were used to determine age classes. Cultural modifications to bone were recorded as in the Arenosa Shelter study. These included disarticulation, skinning, and removal of meat. Similarly, the degree of burning methodology used in the Arenosa Shelter study was applied to the ENC study with further refinement. The presence of earth oven deposits in the ENC rock shelters complicated determination of evidence for bone modification through cooking, but different causes for burning were recognized. To date, analysis of faunal remains has identified 394 fragments surface-collected from Eagle Cave in 2014 and over 300 of the approximately 2,050 fragments excavated from Skiles Shelter in 2014. Twenty three (23) taxonomic assignments have been made for specimens from Eagle Cave, including bison, deer, artiodactyls (deer and/or antelope, turtles (softshells and cooters), rabbit (jackrabbits and cottontails), catfish, bass or sunfish, canids (fox or coyote), rats, undifferentiated small, medium, and large mammals, and undifferentiated small and medium birds. To date, twenty nine (29) taxonomic assignments have been made for specimens from Skiles Shelter. 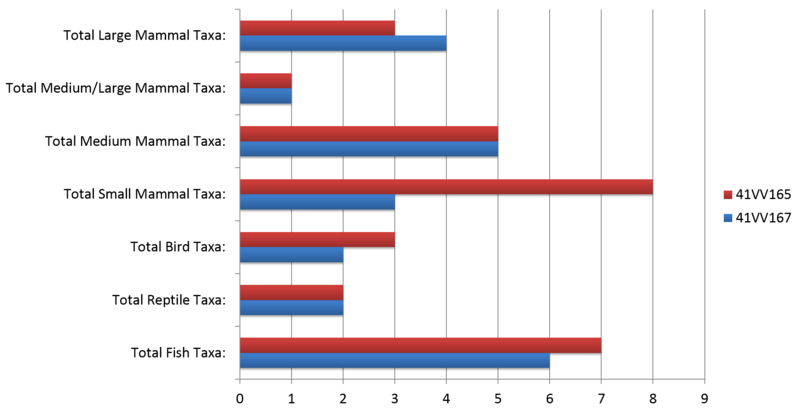 More fish taxa are present, as are more small mammals. Bison is not present in the specimens analyzed at this point. Hawk remains have been identified. Many of the faunal remains present in Eagle Cave and Skiles Shelter have been altered through human subsistence activities. 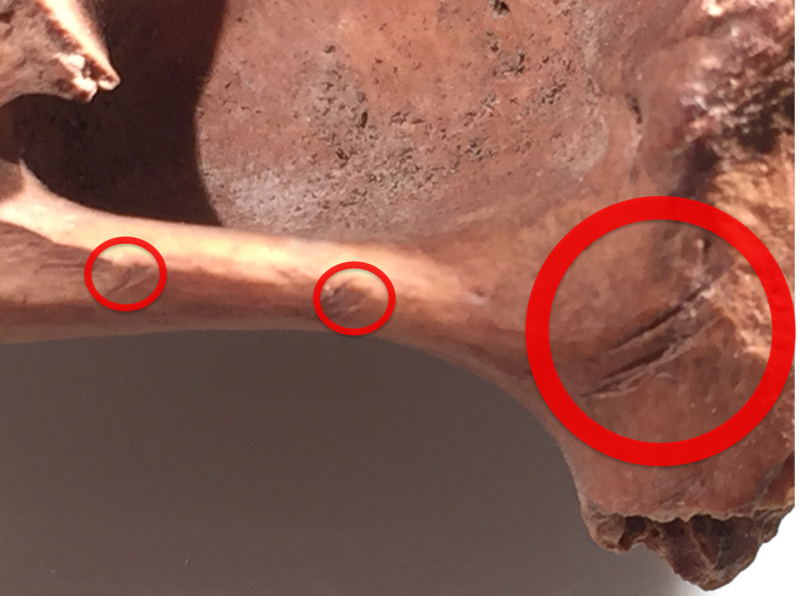 Skinning, disarticulation, and removal of meat all left distinctive cutmarks on animal bone in the two sites. Specific types of meat removal indicate filleting of meat from fish, rabbits, or deer, potentially for drying and storage. Further fracturing of large mammal bones to remove marrow or to recover fat from the ends left bone fragments of varying sizes. 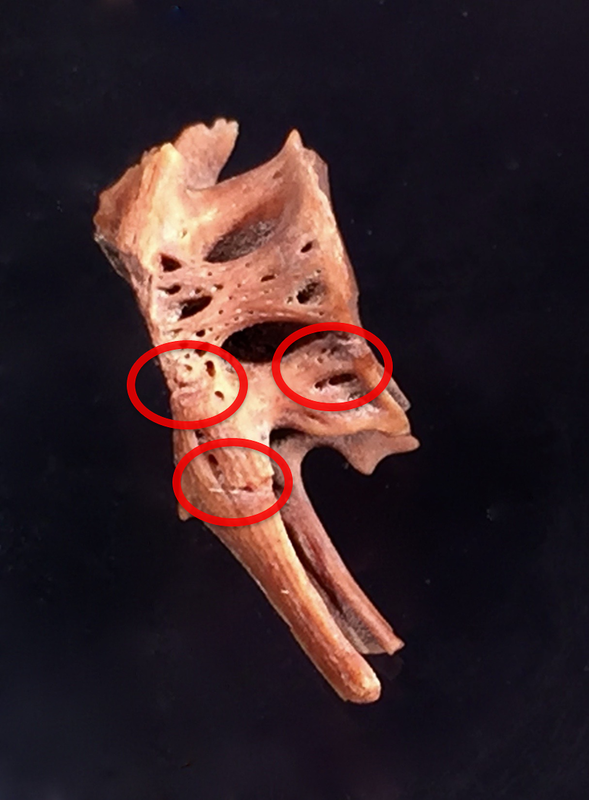 The intensity of marrow or fat recovery processing is evident from the size of the large mammal bone fragments. Roasting is evident on some specimens. Overall intensive burning (calcination) of some of the bone indicates heat exposure in excess of typical roasting. Much of the burned bone in the sites was discarded and incorporated into earth oven fill. After needs for meat and hides were met, remaining animal bone was sometimes further altered into tools or ornaments. Using stone tools or flakes, bone was scored, grooved, and snapped to rough shape, then scraped and ground to a final shape. Remnants of these steps are evident on 35 bone or antler tool fragments or bone manufacturing debris found at the sites during the 2014 field season. We wish to thank the Skiles family for its long and careful stewardship of the archeological resources in Eagle Nest Canyon. We also thank Dr. Steve Black of Texas State University for the opportunity to study zooarchaeological aspects of the sites in Eagle Nest Canyon as part of the Ancient Southwest Texans Project. 2007 Large Mammal Utilization and Subsistence Stress in Late Prehistoric South Texas. M.A. Thesis, Department of Anthropology, Southern Illinois University. Carbondale, Illinois. 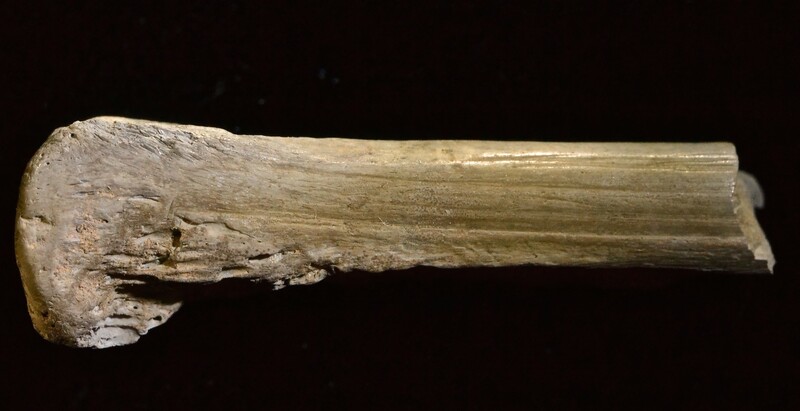 2005 Zooarcheology and Bone Technology from Arenosa Shelter (41VV99), Lower Pecos Region, Texas. Unpublished Ph.D. Dissertation, Department of Anthropology, the University of Texas at Austin. Austin, Texas. 1998 The Identification and Paleoeconomic Context of Prehistoric Bone Marrow and Grease Exploitation. Unpublished Ph.D. Dissertation, Department of Archaeology, University of Durham. 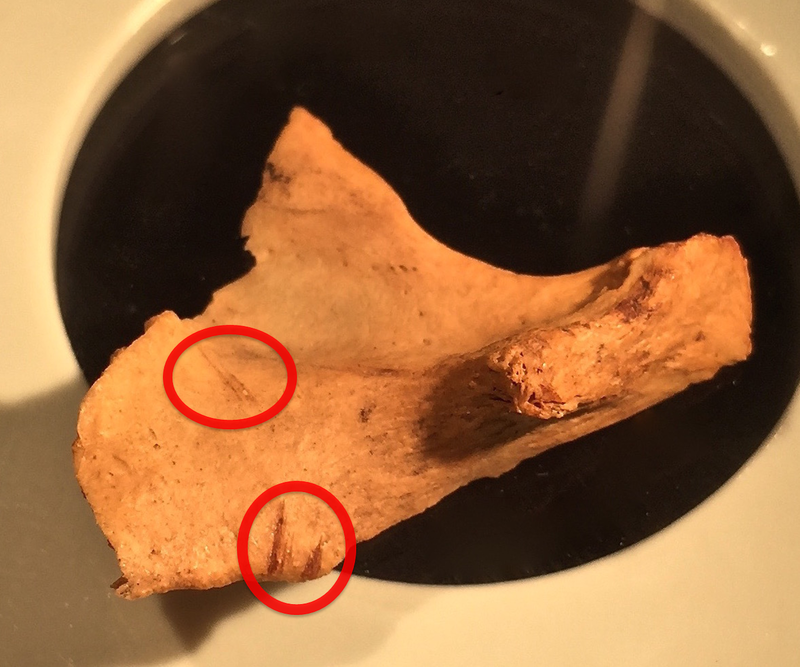 Durham, U.K.
2001 A New Approach to Identifying Bone Marrow and Grease Exploitation: Why the “Indeterminate” Fragments should not be Ignored. Journal of Archaeological Science. 44(28):401-410. 2013 The Rowe Valley Site (41WM437): A Study of Toyah Period Subsistence Strategies in Central Texas. Unpublished M.A. Thesis, Department of Anthropology, Texas State University. San Marcos, Texas. 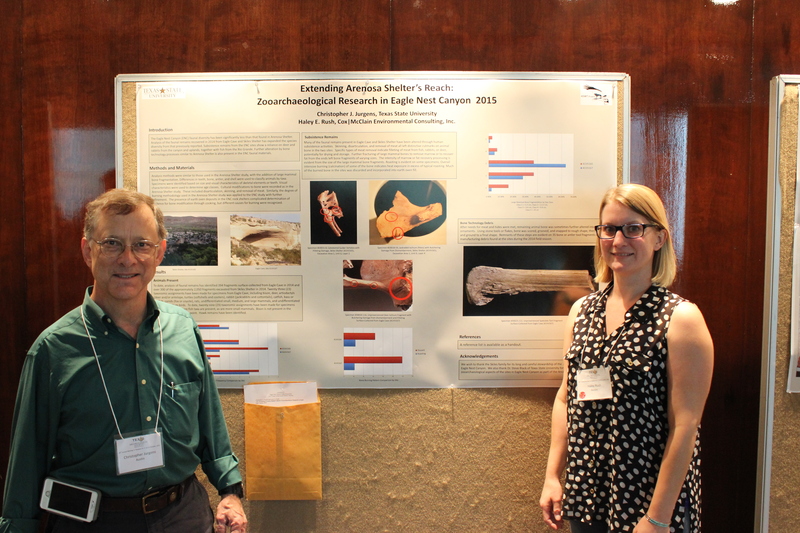 This entry was posted in 2015 TAS Poster Symposium, Zooarchaeology. Bookmark the permalink.